As new settlers arrived in the area, they decided to organize. The Hennepin County Board of Commissioners named the new settlement Plymouth. On April 19, 1858, a group of townspeople met at the home of Francis Day to open elections for town offices. On May 11, 1858, the group voted to change the town's name to Medicine Lake. This was used once at the town meeting, but for reasons, which were not recorded, it was never used again. During the Dakota War of 1862 between white settlers and the Dakota at Fort Ridgely, near New Ulm, the settlers of Plymouth formed a militia. When the Civil War started, Plymouth paid its volunteers $25 to enlist. At about this time, Plymouth's growth began to take on a new look. Schools and churches were built and a post office was in Plymouth. By 1863, hotels were being built. Plymouth was named by Money Magazine the number one city in which to live in the United States in 2008. The magazine gave top honors to Plymouth because of its inclusion of residential areas, industry, parks, schools, and other aspects which make Plymouth a self-contained and essentially autonomous city. Plymouth has a humid continental climate, typical of the Midwestern United States, with very cold but nice winters, and relatively hot, often humid summer days. Summer daytime temperatures average 83 °F (28 °C), with a low of around 60 °F (15 °C), while winter temperatures average only 23 °F (-5 °C) and a low of 3 °F (-16 °C). The highest recorded temperature in Plymouth was 99 °F (37 °C) in 1964, and the lowest was -39 °F (-39.4 °C) in 1977. Rain falls throughout the year, with the highest concentration falling in the summer months, with June being the rainiest with 120.3 mm of rain. As of the census of 2000, there were 65,894 people, 24,820 households, and 17,647 families residing in the city. The population density was 2,002.0 persons per square mile (773.1/km²). There were 25,258 housing units at an average density of 767.4 per square mile (296.3/km²). The racial makeup of the city was 91.36% White, 2.71% African American, 0.33% Native American, 3.79% Asian, 0.01% Pacific Islander, 0.50% from other races, and 1.31% from two or more races. Hispanic or Latino of any race were 1.64% of the population. 27.0% were of German, 13.1% Norwegian, 7.8% Irish and 7.5% Swedish ancestry. There were 24,820 households out of which 37.8% had children under the age of 18 living with them, 61.2% were married couples living together, 7.6% had a female householder with no husband present, and 28.9% were non-families. 21.8% of all households were made up of individuals and 4.7% had someone living alone who was 65 years of age or older. The average household size was 2.60 and the average family size was 3.09. In the city, the population was spread out with 27.1% under the age of 18, 7.4% from 18 to 24, 33.0% from 25 to 44, 25.0% from 45 to 64, and 7.6% who were 65 years of age or older. The median age was 36 years. For every 100 females, there were 97.1 males. For every 100 females age 18 and over, there were 95.5 males. The median income for a household in the city was $77,008, and the median income for a family was $90,134. Males had a median income of $59,751 versus $38,111 for females. The city's per capita income was $36,309. About 1.5% of families and 2.6% of the population were below the poverty line, including 2.0% of those under age 18 and 1.5% of those age 65 or over. As of the census  of 2010, there were 70,576 people, 28,663 households, and 19,230 families residing in the city. The population density was 2,159.6 inhabitants per square mile (833.8/km2). There were 29,982 housing units at an average density of 917.4 per square mile (354.2/km2). The city's racial makeup was 84.2% White, 5.2% African American, 0.3% Native American, 6.9% Asian, 1.0% from other races, and 2.3% from two or more races. Hispanic or Latino of any race were 3.0% of the population. The median age in the city was 39.5 years. 23.9% of residents were under the age of 18; 6.9% were between the ages of 18 and 24; 27.1% were from 25 to 44; 30.1% were from 45 to 64; and 12.1% were 65 years of age or older. The gender makeup of the city was 48.4% male and 51.6% female. Plymouth is an independent district currently represented by state senators Terri Bonoff (D), Ann Rest (D) and Ron Latz (D). Plymouth's state representatives are Ryan Winkler (D), Lyndon Carlson (D) and Sarah Anderson (R). 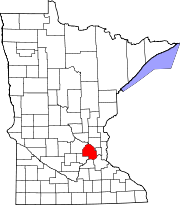 Plymouth is in Minnesota's 3rd congressional district, which is represented by Dean Phillips (D). Minnesota's Congressional senators are Amy Klobuchar (D) whom Plymouth voted for overwhelmingly, and Tina Smith (D). Barack Obama carried Plymouth in 2008 and 2012. Verify election outcomes at the Minnesota Secretary of State's website. Wayzata High School is operated by the Wayzata School District, has approximately 3500 students in grades 9 to 12 (2011), making it the largest secondary school by enrollment in Minnesota. Projected enrollment for the 2012-2013 School Year is 3617. It is also the largest Minnesota secondary school by structural size, with an interior of 487,000 square feet (45,200 m2). The school is part of the Lake Conference. In 2008, Newsweek ranked the school #940 "List of the 1300 Top High Schools in America." The Mosaic Company, OneBeacon, Select Comfort, Christopher & Banks and Tonka Water are headquartered in Plymouth. ^ "Community Profiles". Metropolitan Council. Retrieved 3 January 2019. ^ "City of Plymouth, Minnesota". plymouth.mn.us. Retrieved 2 April 2018. ^ "Streets - City of Plymouth, MN". www.ci.plymouth.mn.us. Retrieved 2 April 2018. ^ "City Council Members". City of Plymouth. Retrieved 3 January 2019. ^ "City of Plymouth CAFR". plymouthmn.gov. Retrieved 2 April 2018.